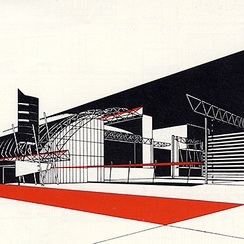 BERNARD TSCHUMI is an architect based in New York and Paris. First known as a theorist, he exhibited and published The Manhattan Transcripts and wrote Architecture and Disjunction, a series of theoretical essays. Major built works include the Parc de la Villette, the New Acropolis Museum, Le Fresnoy Center for the Contemporary Arts, MuséoParc Alésia, and the Paris Zoo. He was the Dean of the Graduate School of Architecture, Planning, and Preservations at Columbia University in New York from 1988-2003. His most recent book is Architecture Concepts: Red is Not a Color, a comprehensive collection of his conceptual and built projects. His drawings and models are in the collections of several major museums, including MoMA in New York and the Centre Pompidou in Paris; in the spring of 2014, a major retrospective of his work was on view at the Pompidou, with an important bilingual catalogue entitled Bernard Tschumi, Concept and Notation. Bernard Tschumi speaks with inter·punct about his incredible career and insightful writings. Read the interview on the inter·punct website.